Thanks for sharing the screenshots! 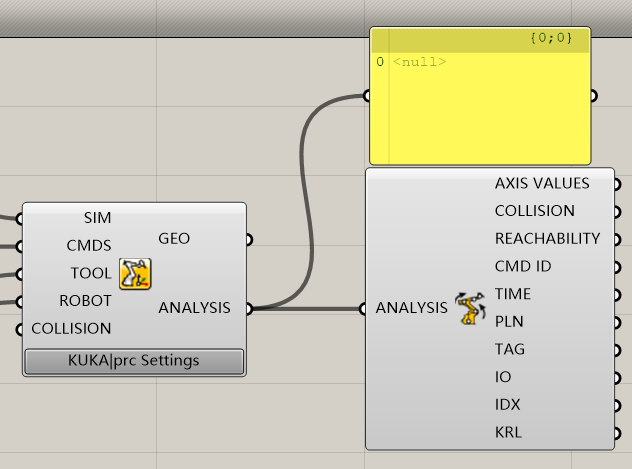 We'll auto-activate the "Output Analysis Values" option in the next release. 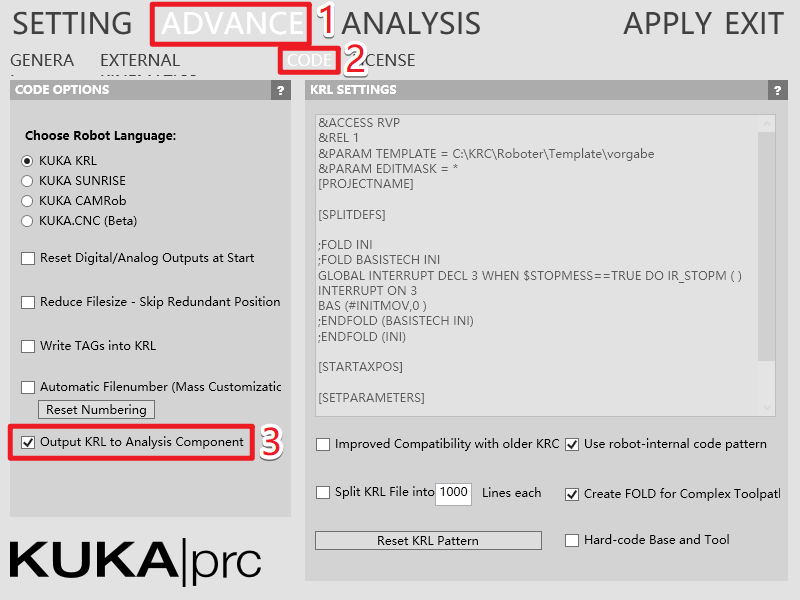 The default behavior is that KUKA|prc generates the *.src file in the background, with the project name and directory as provided in the first page of the settings. The output within GH is mostly meant for special cases, where you e.g. need to do extra edits to the code. So it's not disabled, but much slower. Thank you Johannes! I did things according to your instructions and the KRL is ready. Now I can do some research on these commands. Here is the procedure: I hope these pictures can be some kind of tutorial to new users. Could somebody give us hand or a way how to disable T2 operation mode from use .was reading about kunden_version but I couldn't found it ? Thanks for the feedback, you need to activate the "Output Analysis" option in the Advanced options first. That is not clear, we will fix that in the next release! And Circs are currently set to #VAR, there isn't an option at the moment to change it. You could modify the SRC file, but then the simulation wouldn't be accurate. Just a remark regarding outputting KRL through the Analysis component: Grasshopper can get really, really laggy when you have a text panel with thousands of lines of text, like a KRL program. So it's not KUKA|prc's fault when it gets slow. The trial version is now nearly 3 years old and quite outdated. If you want to give it a try with the most recent version of KUKA|prc send me an eMail (johannes at robotsinarchitecture.org). Circular movements also have several different orientation strategies like #VAR, #PATH, etc. The jitter in the SPL may either be rounding problems or spline interpolation through an identical point. But as I wrote, it's an old version, I'll need to check if that is a bug that still exists. I have received the latest version and the license. Thank you very much! But I still can not figure out how to use VAR or PATH command to set orientation in circular movement. Would you please give me some advice or hint or examples? I think I should use "combine command" to combine a CIRC and something like VAR or PATH, but I am not quite familiar with KUKA command. So I decide to check the KRL output for a existing command and do some backward research, hope to find some clue on the command system. Then I find out that the analysis output did not output anything, neither did the analysis component. I have checked at this red arrow but still got nothing. Hello Johannes, nice to meet you! Thank you very much for your reply! It really helps. I would like to have a try at the latest version. and I had send email to you. Please check!